I am moving house again soon. I have moved quite a few times, but this time I hope to stay much longer, treat it as our home and invest in other properties while there. So how can you reduce the impact of moving expenses? As you are preparing to move, have a proper clean out. List what you can on eBay, Gumtree, Facebook and other places to sell. Anything you don't need and can donate or throw away, get rid of. You don't want to spend time and money moving things that aren't going to be used. If you can, hire a truck and get help from some friends or family instead of hiring removalists. It can save you thousands of dollars. Ask around for old boxes such as in stores, friends and family or put a wanted ad online. Don't pay for boxes if you don't have to. Wrap breakables in linen such as tea towels, sheets and other manchester. You have to move the manchester anyway, why not use it to protect valuables? Other packaging that works well is bubble wrap, newspapers and butchers paper. Label everything clearly so you know what is in each box and which room it should go in. Don't ne haphazard about it, throwing random items in together. Each time I have moved I have managed to clear a room or area so I can pack items that are not needed before the room and start storing them in one spot to make it easier to move. When dismantling furniture put all the little pieces into a sealable bag for each item of furniture. Label it clearly so when you are reassembling, everything is there. If you are relocating in the same area, many providers will waive fees if you ask them to or if you resign for a year with them. Have your mail redirected but also make a list of every service, club, provider and person you will need to notify of your address change. A redirection takes a few days to start, so do it before you actually move to make sure mail is redirected. Be aware, it doesn't pick up on all mail so it is better to set aside a time to contact everyone and have your address changed. Since you are calling to relocate, ask for an ongoing discount. Compare insurance providers and other services as you make all your changes. 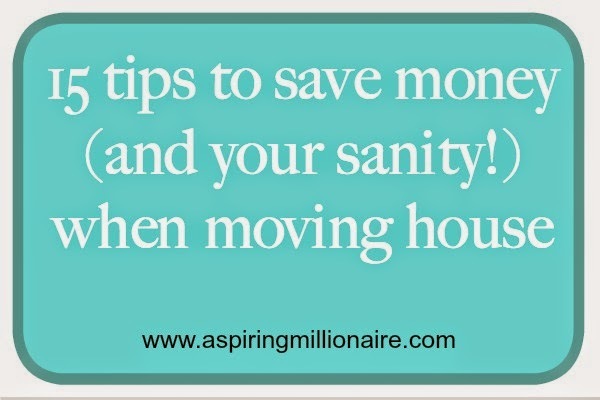 It doesn't take much more time to do and can result in ongoing savings. Don't try to do it all yourself. It is a big job. If people offer to help, take them up on it. Your regular menu plan is going to go out the window. Try to eat down what you have in your cupboards before the move. It might mean some of your meals get a bit creative, but you may discover a new family favourite by doing it. Plan easy meals or if someone offers to cook a meal, say yes! There are various easy to prepare meals you can whip up that are significantly cheaper than take away. I have copies of all my documents scanned and stored elsewhere, as well as the hard copies. Any important papers or things you will need immediately after moving, keep close. Keep some first aid supplies, basic cutlery and crockery and so on in one box or bag to make moving easier and cheaper. Packing so much in a box it is too heavy to lift is a recipe for disaster. Not only is it hard to move, but it is more likely to break which could damage your items too.